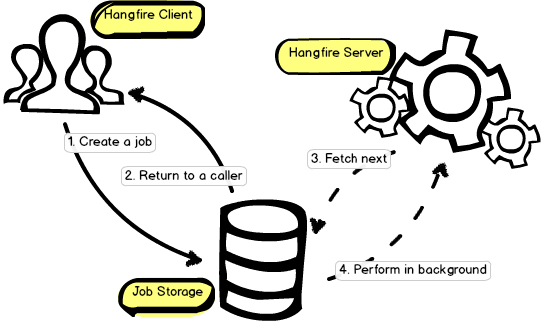 Hangfire allows you to kick off method calls outside of the request processing pipeline in a very easy, but reliable way. These method invocations are performed in a background thread and called background jobs. You can create any kind of background jobs using Hangfire: fire-and-forget (to offload the method invocation), delayed (to perform the call after some time) and recurring (to perform methods hourly, daily and so on). Hangfire does not require you to create special classes. Background jobs are based on regular static or instance methods invocation. There is also more easy way to create background jobs – the BackgroundJob class that allows you to use static methods to perform the creation task. The control is returned to a caller just after Hangfire serializes the given information and saves it to the storage. SQL Server storage can be empowered with MSMQ or RabbitMQ to lower the processing latency. Background jobs are processed by Hangfire Server. It is implemented as a set of dedicated (not thread pool’s) background threads that fetch jobs from a storage and process them. Server is also responsible to keep the storage clean and remove old data automatically. Hangfire uses reliable fetching algorithm for each storage backend, so you can start the processing inside a web application without a risk of losing background jobs on application restarts, process termination and so on.